The Political Environment: Walker's 8-year war on the environment, Part 20. 16 ways he downgrades, denies, or blocks information. 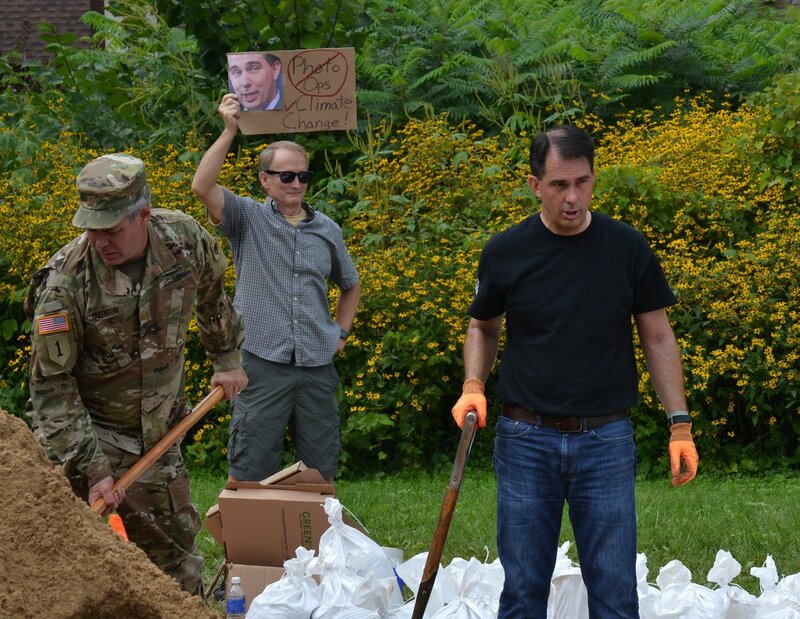 Walker's 8-year war on the environment, Part 20. 16 ways he downgrades, denies, or blocks information. This is part 20 of a 21-part series that will end before the Nov. 6th election about Walker's damage to the state's environment. Today's installment has more than a dozen examples (feel free to add more in the common section) of Walker's belief and practice that the less information the people get from the government they pay for the better off they are, when in fact the only bliss that issues from this nurtured ignorance benefits his donor-benefactors and other allies who fund and fuel his career. Installment 18 - - "The 33 times that science was dissed, dismissed" - - is something of a companion piece. * Walker's chief information-scraper and anti-science cudgel Cathy Stepp of climate change science information from the DNR's website in 2016. * As they had done earlier in 2012. * The DNR took a whole 8 days to 'assess' all the information submitted at a public hearing on four complex air emission permits sought by Foxconn before approving the applications. Does anyone seriously think Walker's DNR seriously considered what the public submitted? * The agency took seven weeks to approve a controversial plan to allow the Foxconn project to be served by a Lake Michigan diversion. Does anyone seriously think Walker's DNR seriously considered all the legal and environmental ramifications submitted by the public at the one and only public hearing it held on the diversion bid? * And speaking of hearings, the DNR clearly lets the public know its hearings are sham theater when it schedules five on a single day to consider various operations on the large cattle-feeding-manure-producing-ground-water-sucking-and-browning CAFOs more for the convenience of staff and experts than concerned neighbors who are then allowed five minutes at a hearing to speak. * Then there's another way to handle public comment and the exchange of information at a hearing: just don't hold one. While a key Walker business ally at the WMC misrepresented as "a book report" the environmental impact statement, (EIS), that Walker made sure Foxconn didn't have to defend, what it really meant was that the public would not be heard on a multitude of potential environmental matters which Walker, Foxconn & Co. did not wait aired. No EIS, therefore, no hearing on an EIS, or its draft - - and, importantly, no record for a fair-minded judge or new administration down the line to access and act upon. * Another way to cut down on the amount of information coming out of the DNR: cut in half the number of issues of its century-old, self-supporting magazine because it was offering too much information that Walker didn't like. * Or cut back the scope of the major information display at the annual state fair to perhaps a couple of pamphlet tables, assuming everyone prefers to use the computers they may or may not have, and certainly can't question all the experts who'd been there in years past. * The same experts who now cannot testify before legislators, lest the civil servants spill the beans about environmental impacts and facts Team Walker would prefer go unmentioned. * And when a DNR committee like its wolf advisory body does meet, it won't even get any information contrary to the administration's pre-ordained point of view because the DNR removed from its membership those with contrary opinions or data. * Another way to limit the information flow inside and from the DNR? Fire scientists, merge their bureau into another that serves business interests, and even make sure that those who survived the cuts and the reorganization don't even have the basic tools to use what's been published, as current and former staffers reported. We no longer have a statistician to help interpret data, a library to provide journals or books, or researchers that monitor fish counts, wildlife health, air quality, water quality and etc…employee scientific knowledge and data specific to WI is stagnant...we cannot do the best job possible for our state. The most alarming issue to me is the great waste of decades of sound science, compiled overtime in on-going studies and data collection. WI had more information about our natural landscape than most states. Abolishing science services put an end to decades long studies vital to maintaining and recovering rare and endangered plants and animals as well as understanding natural communities as information on resilience for climate change. Other ways to stem the flow of information. * Just stop issuing early warnings about the build-up of unhealthy levels of air pollutants. * And if you don't like the air pollution data being recorded, either move the nettlesome sensor and/or disregard the information, or get the US EPA to lower the standards overall for miles around so what's measured doesn't look so bad and polluters can pump out more dirty air without consequence. * Skip reporting deadlines on really important matters, like getting a plan together to fight deer herd chronic wasting disease, or do fewer tests so there's less bad news to analyze, as has been reported. * Or stalling providing the answers to, say, 75 basic water quality issues the federal government had been expecting to receive - - for years. * Or cutting back on water pollution inspections, which means issuing fewer findings and penalties for the public to digest. * In fact, if you have a rapidly expanding but polluting industry, like sand mining, just don't hire any inspectors and there won't be all that pesky documentation for other people to look at. Finally: Go big, as Scientific American noted, in the negative. And remember that Walker tried to quietly change the mission of educators and programs in UW system by removing their historic directive to "extend knowledge...educate people...search for truth' - - and then lied about having done it. - - would be ashamed at how far he'd moved the environment from his own DNR's high-minded but deeply-irrelevant mission statement. Blessed be stupidity, for it shall not be conscious of its own deficiencies. Part 19 ran on October 28, 2018.